Llanynys Community Playing Field Association. We have a right to feel proud about our lovely Pavilion – however there are many issues to consider – please come along to voice your opinion. Dogs are not allowed on the Playing Field even when on a lead. Rhewl Football Club had been members of the Llandyrnog and District Village Football Summer League since 1928 and in 1970 they were once again without a pitch, they were fortunate that Mr. T.O. Jones offered them a field in Clwydfro(the sixth in 25 seasons) and they played there for 3 seasons until Mr. Jones retired and moved to Ruthin. This meant that the club faced having to find a new pitch during very difficult times in Agriculture. However during the early 70’s, moves were afoot within the old Denbighshire County Council to acquire a site for a new School in Rhewl and to this effect the council smallholding of Ty-isa was split up and the two fields adjacent to Ty-isa were transferred to the Education Department. The main man in this was Mr. Peter Hughes, Pant-y-Blodau who was a former Rhewl FC footballer and who worked in the County’s Education Dept; our debt to him is immeasurable. There were massive Local Government changes during that period and the old Denbighshire County was engulfed in the new super county of Clwyd and therefore the building of the new school at Rhewl was ‘mothballed’ for the future. It was agreed that the Ty-isa fields could be used as a playing field for the School and the Community. The local Headmaster at the time – Mr. Elwyn Wilson Jones and his neighbour Mr. Brian Roberts who worked in Clwyd CC’s Planning Department were important in the negotiations to bring this about; a 25 year Lease was agreed with County Council. Following the success of these negotiations a Playing Field Committee was formed with Peter Hughes as Chairman, Brian Roberts as Secretary and Elwyn Wilson Jones as Treasurer – the meetings were held in the canteen of Rhewl School. In 1974 the hedge between the two fields and the some of the Farm buildings were removed to create the new playing fields; instrumental to this were Mr. Eddie Jones, Mr. Clwyd Thomas and Mr. Gwyn Howatson. 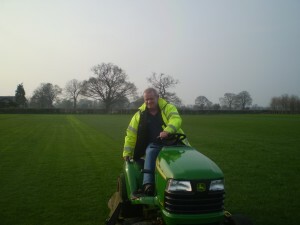 Also a whole host of people including members of Rhewl FC and local youngsters worked hard to level the field. A full size football pitch was laid parallel to the old railway line and a junior football pitch for school purposes was laid between Ty-isa and the old Rhewl Shop. In 1975 the Football club played their first match and in 1976 some kiddies playground apparatus was erected on the field. 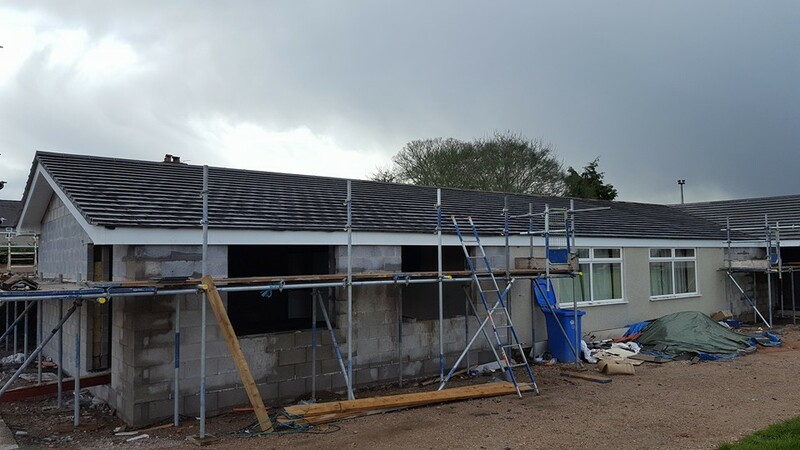 The original pavilion was finished in 1981 with grants from Glyndwr District Council and Llanynys Community Council, £5000 from the Sports Council of Wales and £7000 from Rhewl Football Club. Many local people contributed to fund; examples being J.N.Lewis contributing over £500 of electrical items and Clwyd Thomas hosting barn dances in his shed. During that time the Football Club moved their pitch to allow the Rhewl Cricket Club to have their square off the football playing surface to enable them to play in the North Wales Cricket League. During the mid 1980’s it was realised that the Pavilion was too small and an extension was planned. 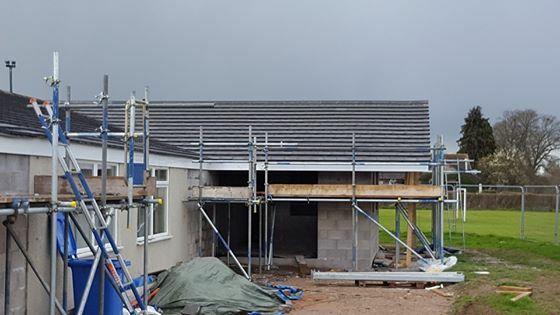 Again grants were received from the Sports Council of Wales and Glyndwr DC; the Football Club also provided £6000 towards the cost of the project. It was felt that ladies of Rhewl were not being treated fairly so therefore Tennis Courts were also provided as part of the project. During this period a very active fund-raising committee raised funds not only for new projects but also to help with the running costs of the Playing Field, Frank Davies was Chairman and Ann Conway was Secretary. Some of the Fund raising events were Car Boot Sales, Sixties Night, Treasure Hunt, Derby Draw, Safari Supper, Barn Dance, Carnival, Cheese/Wine, Bonfire Night and Whist Drives. (Above Photo) – The late Alan Lewis Jones – the Association’s Chairman – receiving a plaque from a representative of the Sports Council of Wales. 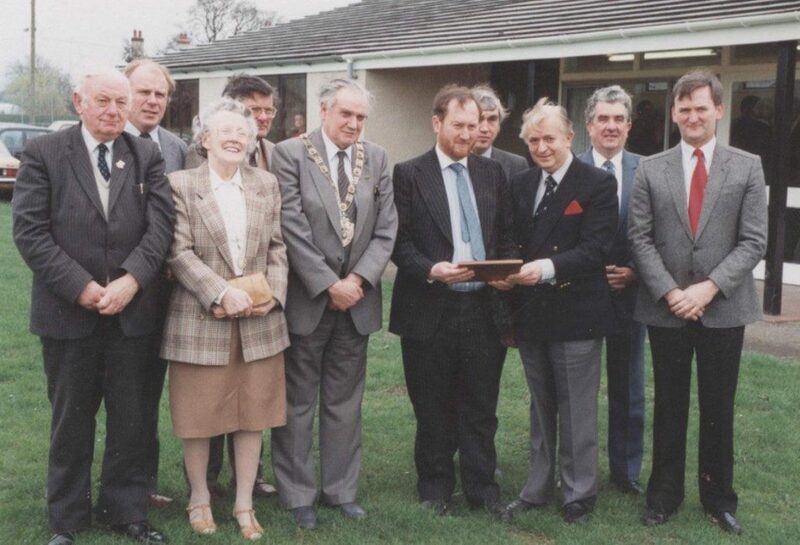 The opening of the extension was carried out by Mr Meirion White, Corwen- Chairman of Glyndwr District Council during April,1991. In the early 1990s the Car Park was extended and also some new Kiddies playground equipment was acquired. During the 1990’s, local interest in the Playing Field waned with new people coming into the Community and not having the same interest as original members. The main Committee took over the Fund raising activities and were not as successful as previously. In 1998, the Cricket Club moved to play their League games at Ruthin School. However the Pavilion and the Playing Field have been very important for the village and particularly the Committee with Ian Hession as Chairman, Debbbie Bridson as Secretary and Ellis Ashton as Treasurer and during the first decade of the 2000’s they, together with the rest of the committee, have strived ‘manfully’ to keep ‘the show on the road’. 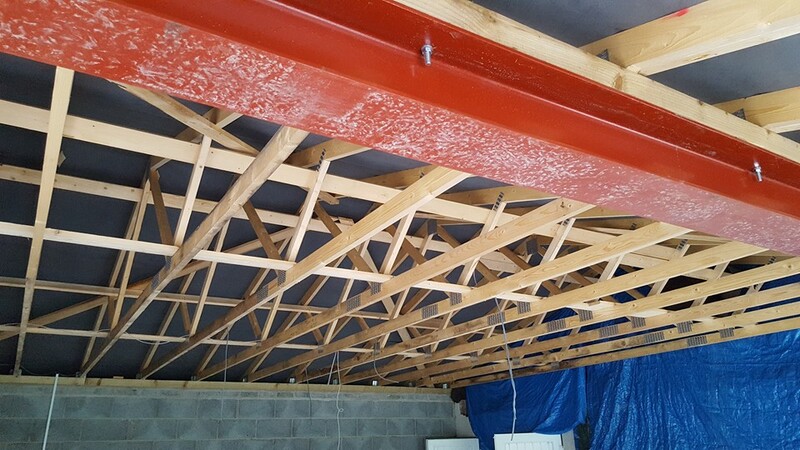 In 2008 a new 25 year lease was negotiated with the Denbighshire County Council. Currently the Committee is working on a project to extend the main hall, a new kitchen and improved toilet facilities. Improved parking and a new access to Station Road are being introduced in the next few months.